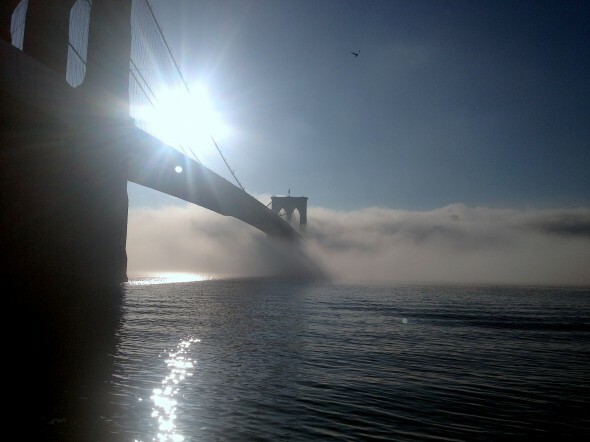 Took a shot of the Brooklyn Bridge on Saturday morning(Oct 20th) while out running. I guess this looks familiar to anyone who has spent time in San Francisco, but here it’s pretty unusual. In fact most people who live here have never seen anything like it. This entry was posted by John Pasmore on Tuesday, October 23rd, 2012 at 9:05 pm	and is filed under New York. You can follow any responses to this entry through the RSS 2.0 feed.